What are the Latest Innovations and Technologies in the Hospitality Industry Powered by Internet? A not so long time ago, before technology reigned supreme over anything else, hotels, motels, and other hospitality establishments were very simple necessities to people — a place for guests and travelers to lay their heads and relax away from home. Ask anyone you know who has spent a fair amount of time in the hospitality industry regarding the role of technology in the said industry. They will say it has drastically increased and expanded. There are lots of innovations made by inventors and experts to make the service in the hospitality industry better and to garner an increase in customers’ satisfaction. Here are some of the latest technologies and innovations in the hospitality industry that runs through the work of Internet connection, all thanks to Fiber Optic Association Cebu. Fiber-to-the-room solutions can help hoteliers ensure their property fits into that “desirable” category, or perhaps, more importantly, to stay out of the “undesirable” category and avoid user complaints on online hotel aggregation sites, which guests browse for property reviews. Mind it, people, reviews are very important! Employing fiber-to-the-room makes it easier to connect every building, room, or anything inside the premises of the hotel and also to provide internet connection to rooms. This gives an option for guests to stay in their room to watch tv with TV-on-demand. Just ask the FOA for more about fiber optics, or go to their website, www.thefoa.org. Self-service is the new trend, and people nowadays prefer to do this. Most of the guests in hotels or any hospitality establishment prefer doing some things with technology like remote check-in and check-out options, and they are really becoming popular. Most hotels around the world are developing or currently having their own mobile application to further ease up their operations, as well as for the customers. This enables them to free up hotel staff from other activities that will let them enhance their guest experience by focusing on more important tasks. And the trend is only going to accelerate. With the technological advancements sprouting up so fast, people are getting a hold of every last one of them also. It seems like hotel guests bring every internet-sucking device they own when they travel, be it smartphone, a laptop or a tablet. It looks just like that nowadays, isn’t it? Whether they are travelling for business or for pleasure, you can bet you’re going to hear about something like if they can’t connect to the internet as quickly and reliably as they’re used to at home. But a hotel is not a home. So, as hotel owners and executives, they should provide their guests the top of the line internet connection. That’s one side hotels should keep working on, because everything right now is on the internet, whether we like it or not. Airline check-ins and local info guides. Hotels should have places like these where guests can relax outside of their rooms and have unlimited and fast Wi-Fi access. That way they can get out of their nests and instead enjoy the view of your facilities. Most hotels are slowly having tech lounges nowadays, as this is to answer the demands of millennial guests. If your hotel doesn’t have tech lounges, then expect your hotel to be ignored by the majority. Tech lounges are beginning to be a very defining criterion for potential guests. 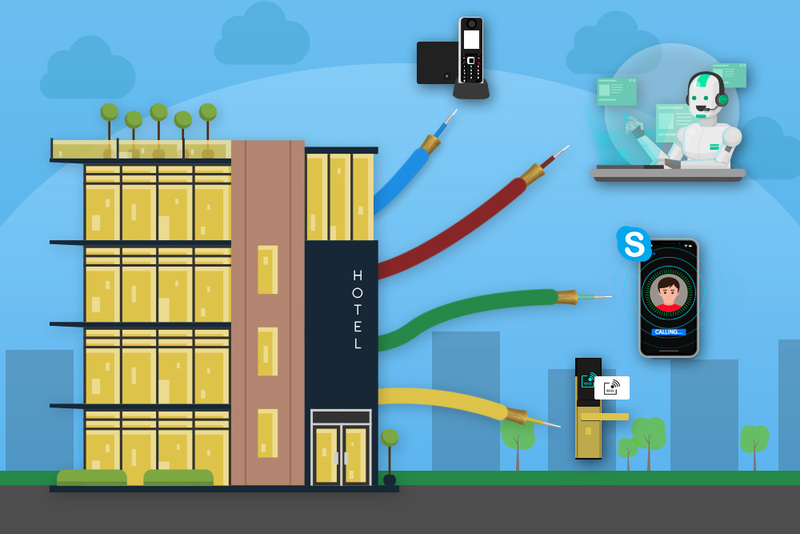 A SIP-DECT setup offers hospitality businesses a comprehensive answer for cordless telephony on IP-based networks, and it brings the kind of features usually found on a fixed network to mobile workers all over your hotel or campus without tethering them down to specific locations. This is a natural fit for every hotelier, as some staffs like valet, bellmen and housekeeping are always on the go. With relatively low cost compared to the alternatives, ease of deployment and quality, predictable voice quality, SIP-DECT is poised to take off in a big way.